Editor’s note: This post was originally published on April 2, 2009. 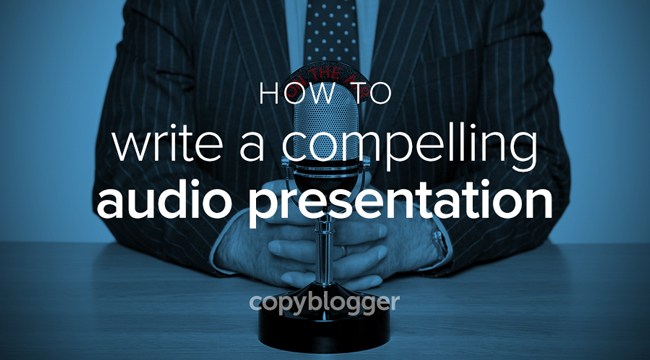 We’re running it again today to show you how to take advantage of the powerful combination of copywriting and audio content. There’s nothing easier than audio content, right? Just fire up your recording software or teleseminar service and start talking away. Well, sure … but “easy to create” doesn’t guarantee anyone will listen (or keep listening). Take some time to structure and prepare for your recording, however, and you can crank out exceptionally engaging audio content that still only takes a fraction of the time that polished writing would. Even though you’re not producing written content, what you put down on paper before you record will make all the difference. Let’s look at outlining your audio presentation first before discussing the copywriting techniques that work as well for audio as they do for text. A detailed outline that guides you through the presentation and reminds you when to use your key engagement techniques (covered below) is absolutely imperative for most people to effectively present in audio. Attention. Attention begins before the audio presentation begins, because you have to convince someone to listen in the first place. So the title of the presentation and key bullet points of what’s in store for the listener is where attention begins, but you must maintain attention with a compelling opening to the audio combined with a reiteration of what value the listener will receive for sticking with you. Empathy. Why empathy? Because you’re trying to form a bond with the listener. You’re trying to create a sense of intimacy that forms a connection. If you achieve that connection with listeners, they’ll know you understand their problems. That makes the desire for your proposed solution naturally stronger … and this is much easier to achieve with your voice than it is with text. Solution. Don’t drop the ball when it comes to effectively explaining the solution. Holding attention and establishing empathy will be all for naught if you fail to communicate exactly how and why the solution works. Just because you understand how and why the solution works doesn’t mean that the listener is getting it, so you’ll want to augment understanding as much as possible. Action. At this point, hopefully you’ve created desire for the proposed solution. But creating desire is not enough. You’ve got to expressly ask or tell the listener what to do next, and also make the call to action as compelling as possible. It shouldn’t be pushy, but it can’t be assumed that the listener will take the next step on his own … so be a leader. Now let’s take a look at how we’re going to present the content in a compelling manner. After that, we’ll look at an example of how each technique fits within our presentation structure. The most powerful persuasive content strategy is storytelling and the smart use of anecdote. Besides being highly engaging, stories are the most effective way for people to decide for themselves that what you’re saying is accurate. So, by choosing the right stories, you’re actually pointing people in the direction you desire. What’s the secret to choosing the right story or anecdote? No matter the subject, the right story is always one way or another about the listeners. Remember that and you’ll become a persuasive spoken-word storyteller. Want someone to “get” what you’re saying? How about if you want them to “get it” in a particular way? The key is to get metaphorical by using language that directly compares what you’re explaining to something the listener already understands. Beyond ensuring comprehension, the strategic use of metaphor or analogy can be highly persuasive. By choosing the right comparison, you can steer people in the direction you want. Positive associations can be created at will, and potential stumbling blocks can be neutralized or reframed. Mirroring is the ultimate empathy tool. Mirroring is a technique in which you demonstrate that you are a kindred spirit to the listener (it helps immensely if this is authentic). In other words, you’re just like your listeners (or more importantly, you used to be just like them … but now you’re what they want to be thanks to the solution). With “mind’s eye scenarios,” you ask the listener to visualize the desired beneficial outcome they hope to achieve, and then tie that desired future projection to your solution using scenarios and results. In other words, this time the subject of the story is literally the listener. You can prompt someone to imagine what they want, and combine that with various related scenarios and potential outcomes that result from the action they take today. This can be a highly persuasive strategy when your solution is tied into a learning scenario that plays out in the prospect’s mind. All of the above may seem a bit esoteric, so let’s look at how we might do this with a real podcast. Let’s say you’re really passionate about the “location-independent lifestyle” and are actually living that way, and you want to convince people that it’s totally doable for anyone who earns their living online. Action: What do you want listeners to do next? Ask them to do it … and be confident about it. You’re trying to improve lives, no reason to be apologetic about it. Want to know why copywriting and written content can be so difficult? When your communication tool is your own voice, it gets much easier. Your inflection, tone, and laughter are naturally apparent, which allows your passion and sincerity to shine in a way that might be lost in text. You can even “hear” someone smile as they speak, and that’s pretty powerful. Thanks, this is great. I’ve been struggling with this lately actually. I write everything out in story form just like I’m talking, but it doesn’t exactly translate like I plan if I try to read what I wrote. I think I’ve been using just “key points,” instead of a full on outline, and that may be why I’m tripping at times during my presentations. Luckily, I’ve just been podcasting for practice so far, but I’m much better at talking at times than typing, so podcasting seems a perfect fit. Really, anyone doing business online should probably learn how to put their content into as many different formats as possible to engage different types of learners. You hear so many teleseminars that seem like people are just “winging it”. Use as many of the senses available to your audience as possible. Portray confidence, knowledge, experience… identify and engage… and use it all to channel with calls to action. Brian, that was a terribly long article (not like you lately). Surprised that, given the topic, this wasn’t a multimedia presentation or at the minimum a podcast! I have just started to really attempt this multimedia malarky and it really is a lot trickier than it looks (or that those info product sales letters make it seem!). The most difficult part seems to be the “performance” aspect, delivering content without sending the audience to sleep, while maintaining a structure so you don’t go all over the map. Yummy, this post is meaty. I’m in the middle of working on developing audio content for the first time right now. I’m finding it a surprising amount of fun. I can’t imagine ever scripting and memorizing the entire thing. I like to write a beginning, middle, and end and then allow my natural rhythm to fill in the blanks. Anecdotes and metaphors have made the content not only fun to create but fun to listen to. Great post. I particularly liked the examples…very helpful! The other thing I’ve found useful on my own teleseminars is having existing clients come on and talk about their own experiences. I didn’t realise I was looking for an article like this until I read it! Thankyou for pointing the way. Excellent, as usual. Some observations about AUDIO QUALITY though – because it’s so often overlooked. Audio quality should match the quality of the content. It’s frustrating to muscle through horrible audio because you suspect the content is worthwhile. Sometimes, it’s too much and we give up. It’s not hard to produce top quality audio these days. Energy. So many people bring no or low energy to their audio. Content rich audio flops when delivered by a boring, can’t spit it out delivery. Putting a smile in your voice, and energy in your audio takes practice. Practice it. On the phone. In your conversations. Especially in your audio. Rhythm. Uncomfortable pauses resulting from lack of preparation, or lack of listening always make me nervous. Don’t bog down. Verbal crutches. “You know?” “Uh, uh, uh.” Most of us have a few. They’ll cripple the content. Know what yours are and cure them. Thanks for picking such a great example to demonstrate the techniques you suggest – that’s exactly my position – my blog is all about being location independent and aiming to convince others how do-able it is! Having recently started to do some audio content, like Chris G, it’s the performance aspect which I’ve found so challenging…and as Leonard mentions, I have to re-record several times to remove the “umms” and trying to make the voice sound a little less monotonous and add more energy! Will def be trying these techniques out next time. Thank you. You make it sound very simple. I dabbled in Audiofeeds a few years ago and I think I am ready to give it another go. Looking at your technique I think that I have been using it all along, but it is nice to see it in print. A great checklist to make sure your audio is on track. I like it! The biggest hurdle is just getting the listeners attention in the first place. You have to “wow” them from beginning to end in order to keep their attention. I seem to do best when audio is not memoriezed. It works well to have an outline of points to discuss or get across to the audience. If I memorize, I don’t sound as natural and my passion for my subject doesn’t ring out as well. I recently heard an unscripted interview of myself – I liked it, and I agree with you, I could hear my own smiles in my voice. If anyone’s interested in hearing the smiles go to http://infwa.com/authors-unscripted-talk-show-episode-8-telltale-souls-by-lynn-henricksen/. I listened to an audio on that radio show today by Lisa Manyon who is a copy editor and press release expert, so you may find that interesting, as well. I’ve started producing more audio content, it’s great fun to do. And I couldn’t agree more, you’ve got to head in with a solid structure. Probably more so than when you approach a page to write, because it’s trickier (though possible) to move pieces around and rearrange the structure later. That’s a really nice start to the series and I’m looking forward to the rest. I am currently developing some teleseminars for people starting a business be it conventional or internet based and this post is just SO helpful. Thanks for sharing this with everyone. AESA that is? Attention, Empathy, Solution and Action. Good rule for audio copywriting. I haven’t heard of Alex Mandossian’s scripts. It should be hard work to memorize everything right? I prefer to speak what comes to my mind on that moment. I haven’t done audio but I have done presentations where I speak only what comes to my mind. Never thought AIDA or AESA would work for audios and presentations. I don’t know why but I’m loving all the modifications of AIDA. I remember Michel Fortin writing a modified AIDA by the name QUEST. Is there any other modified AIDA? By the way, your example story was very good that you already sold me an imaginary product. Thanks God I didn’t have to pull out cash from my pocket this time because there was no product. You seem to sell me all the time with stories. I remember your last post on “How to write a story that sells” in which you again sold me an imaginary product. I have found this endlessly useful and have flagged it for future reference. Thank you! Mirroring and Minds-eye are great tools. Unless one has the command of the audience already identifying with the listener and encouraging visualization as to “anticipating” the benefit of said product/service is a nice closing. Not in total agreement with rote memorization. Some things are better left to knowledge and experience. “Off the cuff” is always entertaining and engaging, but being prepared period is what counts. Emplic – Very well said – I couldn’t agree more. Fantastic resource – to someone new in the game, this is just what I needed! I have also been told to keep a mirror at your desk to make sure you are smiling or frowning or whatever so your emotion comes through in your voice. Christie, I’m pretty new to this also. The mirror idea is one that I’ll use. Thank you! Certainly no one would like to listen the voice of huhh … haaa … yes and all. Everyone should go with your flow of your voice and for that you should prepare your home work nicely. The planning side of a presentation of any sort whether it be audio, video, online or offline is often overlooked. I was lucky enough to go (actually I was sent!) to a great training course on presenting quite a few years ago and I still use the techniques and “planning pyramid” to this day. One of the key points our trainer made was that planning is imperative for a successful presentation. He also said it doesn’t have to take a lot of time. really sums up a great, valuable podcast. I have been following that recipe with great success with our Podcast Series “RiSE”. This post was more helpful than you know. My video podcasts kept averaging 9-12 minutes and I wish they were 4-6 minutes. Your simple strucutre: attention, empathy, solution, action is a great outline that I will use as I make my new podcast today. It will help me stay focused which I need! Interesting article. Were did you got all the information from…. I really loved the post so I used my Digg account to digg it. tremendous more please great.